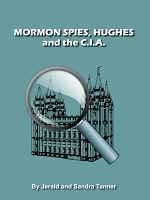 Additional Info: Includes: Howard Hughes and the "Mormon Will"
Sample PDF: Sample PDF of Mormon Spies, Hughes and the C.I.A. Our Digital Books are in Adobe's PDF format. The digital book download link is sent to your email address used to place the order, usually within 24 hours or next business day. If you want this digital book download link sent to a different email, please indicate in the Special Instructions/Comments section at Checkout. Howard Hughes and the "Mormon Will"